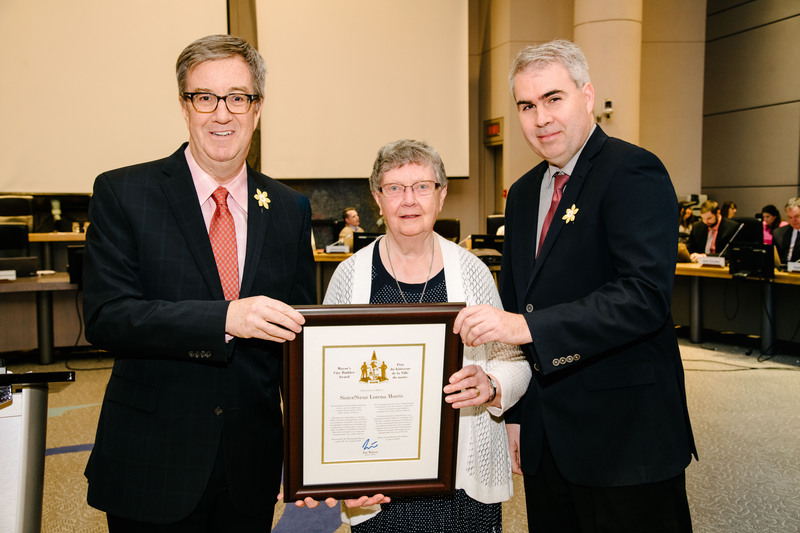 Mayor Jim Watson and River Ward Councillor Riley Brockington presented the Mayor’s City Builder Award to Sister Lorena Morris at City Council today, in recognition of her community service and for helping found the Caldwell Family Centre. Sister Lorena Morris moved to the Ottawa area in 1979 with Sisters Thelma Marion and Madeleine Rochon with the idea of providing assistance to those in need. Moving into the Caldwell neighbourhood, the sisters immediately began to help the less fortunate. They offered cooking classes in their residence to help feed those in need, and gradually expanded that work, giving birth to the Caldwell Family Centre. As the recipes and their expertise grew, they established a hamper program and soon the sisters were also teaching English as a second language to new Canadians. Sister Lorena Morris took on the role of Executive Director at the Caldwell Family Centre, developing it into a food bank, learning centre and community support hub. The Centre continues to serve the community today, feeding more than 500 families every month, providing health and wellness education and helping new Canadians settle in the neighbourhood. The Mayor’s City Builder Award is a civic honour created to recognize an individual, group or organization that, through outstanding volunteerism or exemplary action, has demonstrated an extraordinary commitment to making our city a better place today and for the future. This may include lifelong service, outstanding acts of kindness, inspiring charitable work, community building or other exemplary achievements. Individuals, groups or organizations may be nominated by members of City Council or the public. The award is presented at the beginning of each City Council meeting.